Golfers are very lucky to view the wonderful scenery which we get to recreate in. In some cases it’s the picturesque contrast of the dry, sandy desert against a bright green grass, or it could be fairways lined with majestic pine trees, or sometimes it’s the wetlands with wildlife and plants that you would possibly never get to see otherwise. The majority of golfers would certainly acknowledge that the scenery and the beautiful outdoors is one of the reasons we love to play golf. Even a mini course in the middle of the city is a nice, welcome retreat from the usual chaotic scenes and the hustle and bustle we see on an average day. You’re there because you love it. You’re there because you want to be. It’s a release from our every day worries. It’s a respite from the pressures of our jobs. It’s a break from all those people who want a piece of you all day. It’s time-out from stress and having to think hard to solve problems. And for some of us, it’s an opportunity to challenge ourselves when we don’t get enough of that to stimulate our brain as much as it needs to feel alive. On top of that, we get to do it with people of our choice, like-minded friends and friendly souls to exercise our social nature. Often it’s even the golfers who play golf for the intense competition and big money who ultimately play for those same idyllic reasons. What I’m really saying here is that we don’t deserve to get angry or frustrated when we’re playing golf. What? No, we don’t. But I just missed a 3 foot putt that cost me $100 and yes, I am angry about it and experiencing frustration! Go and reread the first paragraph again. Doesn’t it seem downright silly to be angry given all that? Just the fact that we have enough money to be able to spend some of it this way puts us in the top 5% of people on this planet who can even afford this luxury!! Do you know how lucky we are to be able to even play golf? Billions of people don’t know where their next meal is coming from and so we have only the right to be thankful and grateful. And yes, even a duty to really enjoy everything about this game, even the times when we don’t play so well. That’s what we call “perspective”. I know, I never thought of it that way either until recently. We take so many things for granted in our lives and I’m now going to make every effort to be grateful and thankful that I can play this great game. This new attitude towards golf will not only keep my body’s natural balance in order, but I believe it will also do something good for my spirit and end my golf frustration. I have to admit to you, I threw a club a few years ago! It’s true! I was so angry with myself for missing a putt that I believed I should have holed. I winged my putter about 30 feet toward the next tee (didn’t want to have to do any extra walking you see- Hah!) You know, I wasn’t even so angry that I missed the putt as much as I was for not following all of my own advice that I’ve been giving out. I didn’t follow through and didn’t hold my finish and so the putt was a weak stab. I was angry for not living up to my own expectations. And how many times have I preached and written about not having expectations? And there I went and did it myself! The really ironic thing is the fact that I had expectations of myself to play the way I instruct others to, perfectly, all of the time. And this was exactly the cause of me not playing the way I teach others! That’s the reason why I missed that putt! 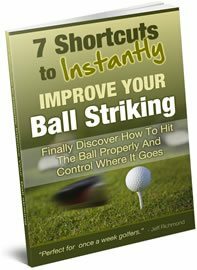 If I had put myself in the correct frame of mind BEFORE playing golf that day, and kept myself in that frame of mind, then I would have given my subconscious mind the opportunity to consistently follow all the instructions I’ve been giving it – including making sure that I hold my finish on all of my putts. It all goes back to internal representations, it always does. More confession time: That day that I threw the putter, I was on the 6th hole and that putt was about 4 feet for a birdie. I had parred all 5 holes prior to that. So even after missing that putt, I was still at par. So I tried to pull myself together, because I was well aware that there were plenty more holes yet to play. But guess what, the chemicals in my body had already been released from my little tantrum. My minimal brain had already taken over my neurological processes. I read in the book ‘Emotional IQ’ by Daniel Goleman that when this happens, you are at the mercy of that part of your brain for awhile. Normal patterns of electrical impulses in the brain get redirected so that some information doesn’t get registered in parts of the brain that help with making informed decisions. Have you ever heard someone say something like “I’m so mad I can’t even think straight?” That’s actually a physiological fact. I thought to myself, “No worries, I’m an expert at this kind of mental control so I’ll be fine”. But I was not fine! I was in denial and I carried on playing golf in the same poor manner that I had been prior to losing my cool. And I went on to double-bogey the next 2 holes! I never really recovered that day and my score showed it. I vowed to go home and figure it all out and find out why and never let it happen again. You know, we’re all human. Give yourself a break! Get in the state of mind at the beginning of the round where you believe deep down that no matter what happens you’ll continue to enjoy the thing you honestly love to do – PLAYING GOLF! What I really want you to get from this article, this lesson, is that the best cure for negative emotions is prevention. It’s so much easier to not have a loss of emotional control in the first place than to try to recover from one. In Part three of this lesson, I’m going to discuss what you can do to get back into control when you do lose it. About the author: Craig Sigl is golf’s anti-practice expert. For years, he struggled to break 80 like so many amateur golfers. After throwing his clubs in the corner of his garage and giving up, he discovered golf’s secrets that changed his life and renewed his game. A year later he scored 77 on a championship course. He then went on to drive his handicap down to a 5, make a hole in one, and record his first under par round…all without practicing. He is now a mental toughness trainer and teaches his methods to golfers worldwide. 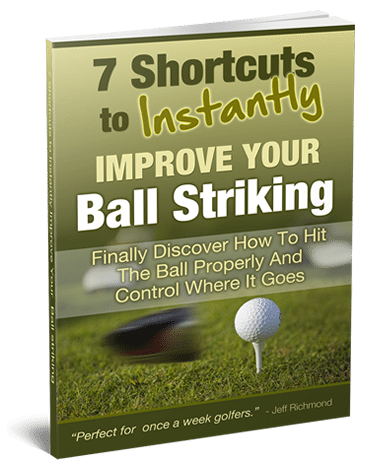 To learn more about breaking 80 without practice go here now.